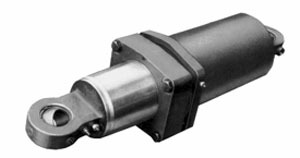 We produce a variety of cylinders for many different applications. If you need more information about any of the cylinder types below, contact us. 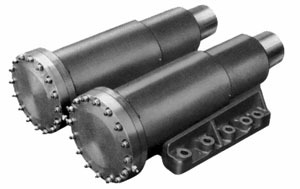 Telescoping cylinders used in off-highway equipment s shown here feature major bores up to 16"; strokes to 220". We can accommodate as many stages as space limitations demand. Typical double-acting, mobile-type cylinder used in off-highway construction equipment. Features include lasting, wear-resistant, chrome-plated rod. Storkes to 25 feet; pressure to 5000 psi. Shown are optional self-aligning bearings. Custom-designed mill-type cylinder built for 5000 psi service. 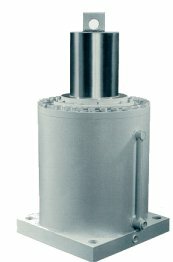 nominal 12" bore, available from 4" through 26" bore size. Pair of heavy-duty ride struts for off-highway trucks. Nominal 12" bore; oil over nitrogen. Press cylinder with 24" bore capable of utilizing forces in excess of one millions pounds. Available with bore to 26". The 96" closed-length cylinder below, remanufactured by United Hydraulics is of the type used on loaders and dozers. The unit features a 12" bore and 70" stroke. United remanufactures all types of customer cylinders to OEM specifications, and guarantees customer satisfaction.